The good news is ferret litter training is possible. The bad news is, getting your fuzzballs to use the litter box consistently is next to impossible. If you’re lucky, you’ll buy a fuzzbutt that’s already housetrained by the mother ferret, previous owner or shelter worker. If you buy your fuzzy in a pet store though, chances are the kits were taken away from their mother before she had the chance to teach them to use a litter box. And the pet store employees just don’t have the time for ferret potty training. Fret not (couldn’t resist), you’re not on your own. Here’s some ferret litter training advice that will turn the bad potty behavior into good. First things first, make sure you buy a suitable litter box. If you have a small or old fuzzball, make sure the side isn’t too high to get in to it. Don’t buy one that’s too small or low if you have a big male ferret. Otherwise, Mr. Fuzzbutt will poop right over the side. To make things easier during ferret litter training, for both you and your fuzzball, limit the free space he has while potty training. A smaller cage will give your fuzzy less options about where to go. Confine his free range space as well until he knows he should use a litter box. For some reason, fuzzballs love to do their thing in a corner. They will usually run towards a corner, turn around and back up (I’ve seen otters do this backing up thing too). This is a good thing for you. You’ll recognize the behavior, and it makes your ferrets pooping habits rather predictable (just check all the corners for any mistakes). Unfortunately, very, very rarely, they do go in the middle of the room (I’ve only had this happen 4 or 5 times in 4 years). It’s always a good idea to keep a little bit of poo in the box until your fuzzball is fully trained. It reminds him that it’s a toilet, not a sleeping bed/playground/snorkel box. 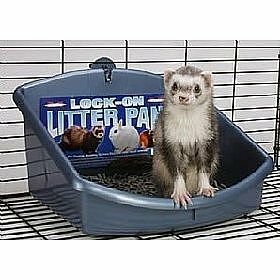 Once your fuzzy knows what a litter box is for, you can expand his available space (both inside and outside the ferret cage). As he gets more room to roam, place several litter boxes in the room. If he has to go and there’s no litter box in sight, he’ll just go in the nearest corner. Instead of trying to convince your fuzzy to use the corner where you put a litter box, place the litter box in the corner your fuzzy seems to prefer. Don’t worry, you’ll get used to being trained this way by your ferrets. Now, as for the actual ferret litter training. A fuzzy usually has to go potty within 10 minutes of waking up. If you see he woke up, put him on his toilet. He’ll jump out, just repeat the process until he actually used it. As soon as he goes, praise him verbally, pet him and let him out of his cage. If you see him backing into a corner outside of his cage; say no very firmly (or any other word you want to use), pick him up and put him in a litter box. Again, if he goes on his toilet praise him exuberantly. Beware of fakers! Sometimes, a fuzzy will pretend to do his business. Not only will he jump inside the litter box, he’ll even back up and stand there for a little while. I’ve trained both my fuzzbutts to be poop fakers. Obviously not on purpose. You can read about how to prevent it in the list of don’ts below. Never ever hit your fuzzball for not using his toilet. Accidents will happen and ferret litter training really is an ongoing process. Especially when your fuzzy is concentrated on playing or stealing. Ferrets are small animals so they leave small pools and puddles. Just clean it up and focus on your fuzzy doing the weasel war dance to forget about the little mishap. I don’t know where that awful idea came from, but don’t rub your fuzzies face and nose in an accident. It doesn’t work with dogs and it won’t work with ferrets either. There is absolutely no way your fuzzy could know why you’re putting him through that. tag. Details of this can be found on .